Have you ever wanted to view the night sky through a telescope? And even better, learn to operate the telescope yourself? If so, you don’t want to miss this opportunity for a FREE training and telescope viewing session provided by amateur astronomers from the St. Louis Astronomical Society! The evening program will begin inside with hands-on training, focused on teaching you and your family how to operate and use the NEW library telescopes now available in your public library (telescopes will become available to the public after April 11th)! 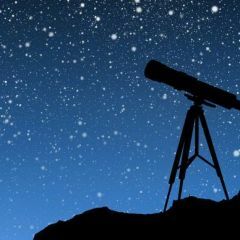 Guests will learn how to unpack the telescope, get the telescope ready for operation, find objects in the night sky and about telescope safety issues. Using the telescope is surprisingly easy and fun for the whole family! Weather permitting, the class will adjourn outside and apply what they have learned to find objects in the night sky. Thursday, April 11th, at 6:30 p.m.
O'Fallon Public Library Community Room, followed by stargazing on the O'Fallon Public Library lawn.